The Alberta Clipper Hunting Retriever Association is an Edmonton area based club with members from all over Alberta and club land near Wabamun. 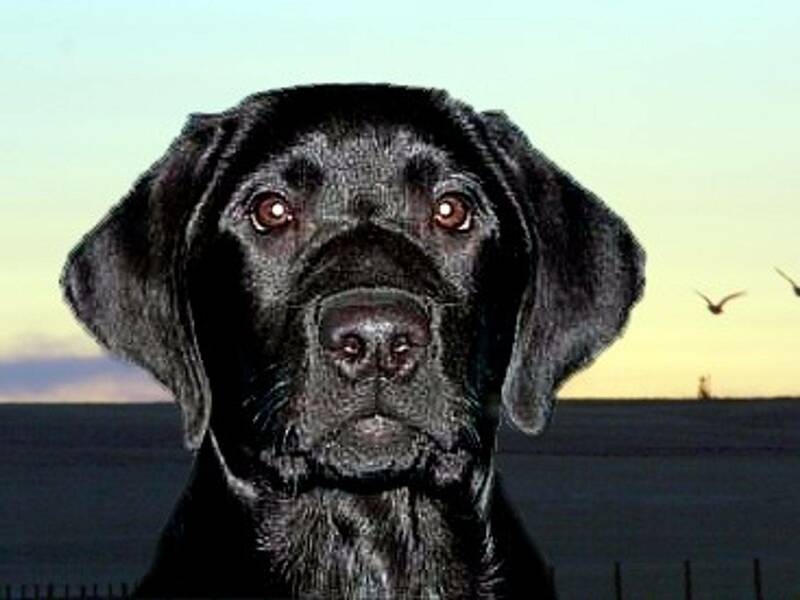 ACHRA is dedicated to the betterment of hunting retrievers through training, education, breeding and the testing of that training at hunt test events. ACHRA is an affiliate member of the Canadian Kennel Club and the North American Hunting Retriever Association. Currently ACHRA is sanction to offer licensed Hunt Tests and Working Certificate Tests. Hunt Tests - Hunting retriever clubs throughout North America provide a venue for trainers and handlers to assess dogs trained and inherent abilities. A finished retriever is required to perform numerous tasks while afield. Hunt tests are designed to simulate as closely as possible situations a hunter might encounter in a typical days hunt. Training - Finished retrievers are developed over a period of time using a combination of yard drills interspersed with appropriate field training. Developing the relationship between handler and dog is a must if the partnership is to succeed. Training and handling classes occur both formally and informally and offer members the opportunity to acquire the skills to develop the teamwork required to produce a finished retriever. ACHRA has some exciting news!! WRHRC will host a Mitch White seminar at their training grounds	in	Kathryn, 60	km	NE	of	Calgary. Planning is well on its way and we are very excited for the opportunity to host such a prestigious event. For more information check out the Canadian National Master Website. Unfortunately there will not be any winter training classes in 2019. The purpose of these classes were to prepare dogs and handlers for a Junior Hunt and Working Certificate level of participation. Classes are open to ACHRA members only. Check out the Training Classes page for more information. 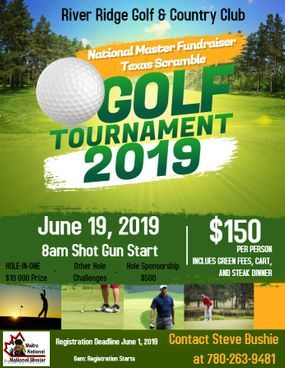 We are hosting a fundraising Texas Scramble Golf Tournament for the National Master! 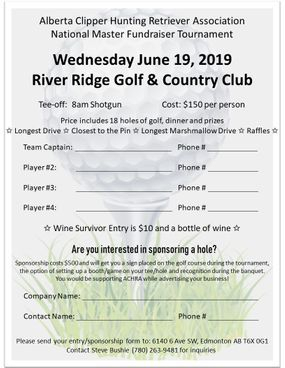 Contact Steve Bushie for more information 780-263-9481. 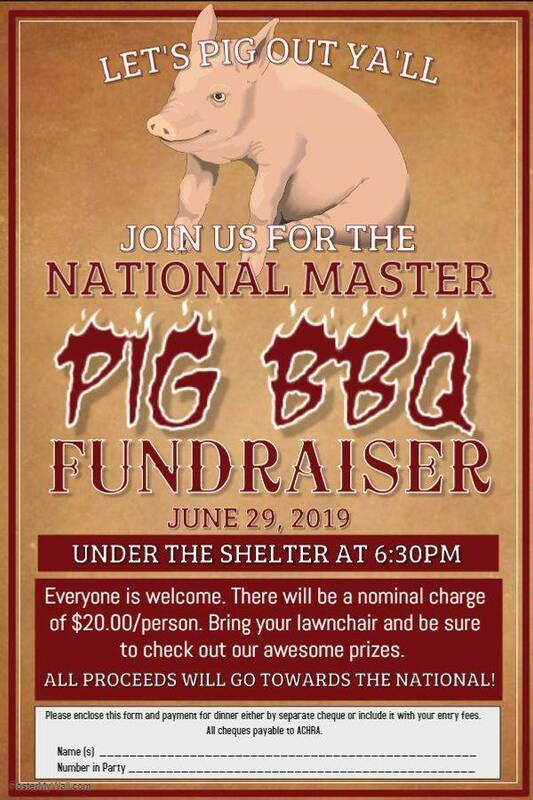 Everyone is welcome and it is sure to be a feast! 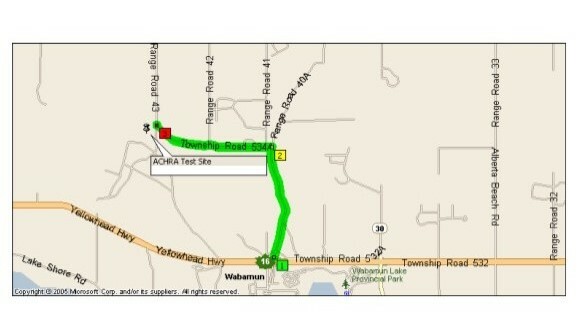 Here is a map to our training grounds. Travel West from Edmonton on Highway 16, (Yellowhead Hwy). Exit North off Hwy 16, at the Wabamun town exit (also signed for Whitewoods Golf). Head North 3kms on Range Road 41 to Twp. Rd. 534. Head West on Twp. Rd. 534 for 3.3 kms. Turn left onto the gravel road, our property is a small drive up the road, has a green gate at the entrance, on the right hand side. 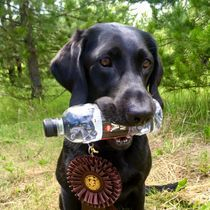 Sidney retrieved some #customlabelwater at the Alberta Clipper Hunting Retriever Association... good dog. And that face? So sweet! ACHRA had a table set up at Cabela's Edmonton South Store September 22 & 23, 2018 for their Sporting Dog Days. Colleen, Sarah and Bond, the Yellow Labrador, had a great time handing out information about our club! !